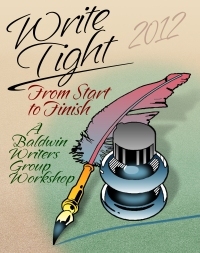 Last Saturday, I had the pleasure of speaking about editing at Baldwin Writers Group's second annual Write Tight Workshop. We had a great group of participants, and it was delightful to mingle and talk about writing with friends I hadn't seen in a while. Candace Sams and Cynthia Eden - both well known and heavily published writers of paranormal romances and thrillers (70 books between the two of them) - presented excellent information on the writing process and developing characters along with helpful information on social networking. I plan to incorporate a number of their ideas into my writing and my social networking - Twitter is still an annoying process to me, but I am striving to make it work for me. I am pleased that Twitter is spreading the word of the MAC writing contests far and wide. I had an entry from India this month. The Write Tight workbook that Candace and Cynthia and I incorporated our materials into will be on Amazon in the near future and I will post that information here when that happens. As always, Steven Moore, President of BWG organized the event seamlessly with wonderful snacks (love the cups of peanut butter!) and lunch and handouts, announcements, etc. BWG will be selling their newest anthology in the near future and I'll keep you posted on that as well. Three days left in the June MAC contest, so get your entries in before the deadline. Have an enjoyable 4th of July to celebrate the best democracy in the world!